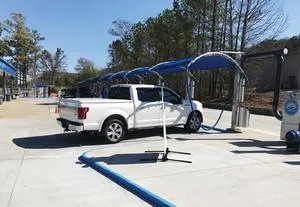 Carolina Pride Carwash Systems and Solutions has been providing car wash operators throughout North America with industrial grade wash systems for more than 52 years. 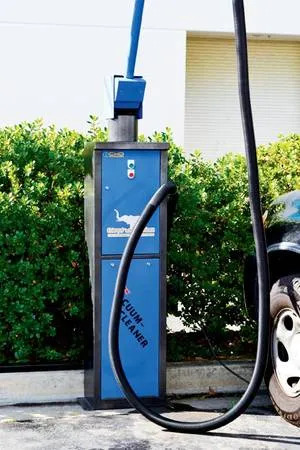 Carolina Pride offers many services, including car wash payment and management systems, Turbo Dry, Performa, Express, and the newest OPTIMAX Series of self-service wash equipment. 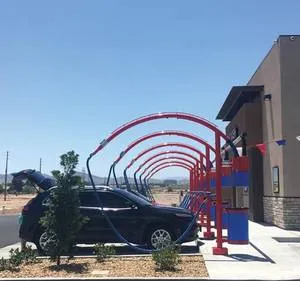 In addition, the company offers its Tunnel Solutions line of equipment, which includes the popular Solution Control Center and Motor Control Centers, spot-free rinse systems, vacuum stanchions, and an online car wash academy. What’s New/Best Seller • Crescent Vacuum Stanchions. 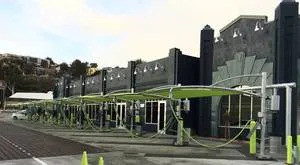 Advantages/Features • The industrial grade Crescent Vacuum Stanchions are a great way to draw in customers with high visibility, while marketing the wash as a full-featured, self-serve facility. The stanchions come with a standard single or dual vac drop, 1-1/2” x 15’ flexible hose, and are powder coated in the choice of colors (yellow, green, red, blue, black, or gray). Optional features include: overhead vacuum piping, vacuum debris separator, vacuum claw holder, crevice tool, LED light bar, refuse container, push button start, floor mat holder, bottle holder, and custom graphic panel insert. Advantages/Features • Industrial Vacuum Systems’ free use vacuums are a great alternative to a large costly multi-drop central system. The system utilizes two or three motors with a low 24-volt, push-to-start timer or an on/off switch. Units feature an easy-to-clean filter system along with a large debris area for easy cleaning. The bottom line is efficiency, longevity, and performance, which creates loyal customers and ROI. 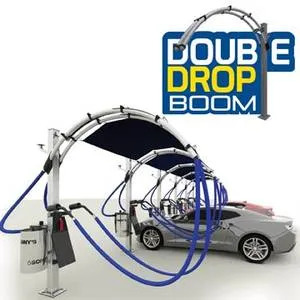 What’s New/Best Seller • New Double Drop Vacuum Boom. Advantages/Features • Sonny’s Double Drop Vacuum Boom accommodates dual drop systems for increased volume. Customers have easy access to the vacuum stations from both sides of the vehicle, and are sheltered from harsh elements. The vacuum boom offers a range of optional accessories. Canopies, mat racks, trash receptacles, air drop kits, and separators can all be added to the booms to customize the site and the customer’s experience in the vacuum area. What’s New/Best Seller • Stainless Steel Stanchions for the Mounted Vac System/Central Vac System. Advantages/Features • Central vacuum stanchions make a statement and draw customers to a wash. J.E. Adams offers these stanchions in stainless steel for its three models of central vacuum stanchions: single arch, dual arch, and no arch. Systems are available with swivel and fixed-arch booms. Commercial no-pay vacuums and pay vacuums are available with stainless steel or lighted domes. Operators can draw extra attention by adding the available LED light strips to the arches. 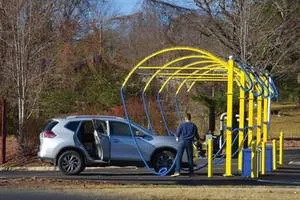 Systems come complete with matching canopies to provide a shaded area for customers to clean out their cars. Trash cans and mat racks are included with the stanchions and are made of stainless steel. The stanchions are available in red, blue, yellow, and green powder coat. 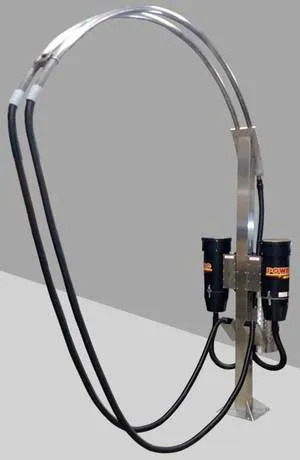 The stainless steel arch includes a quick disconnect coupler allowing the removal of hoses at the end of the day to prevent theft. Each unit includes a hanger that mounts to the pole for easy access and storage of the claw tool. For more than 20 years Mr. Nozzle has been a leading manufacturer and distributor of vacuum nozzles, crevice tools, vacuum hoses, wet/dry vacuums, vacuum hose ends, and many other vacuum attachments. 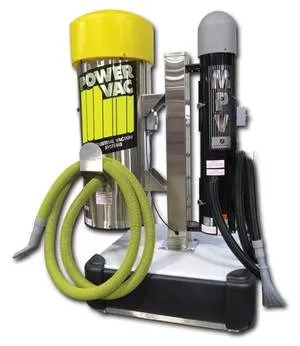 Eurovac is an industry leader in centralized vacuuming and automotive detailing. 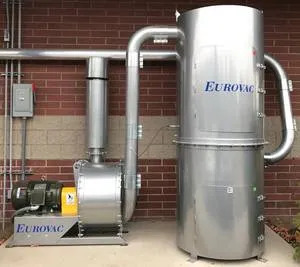 For more than 30 years Eurovac has built systems that work all day. Advantages/Features • The Doyle Stand-Alone Vacuum Arch System can be set-up with either a single- or dual-arch tube. The arch assembly is fabricated from 100 percent stainless steel, and includes a tool holder for each hose (accommodates either a standard upholstery tool or a crevice tool), and trash receptacle sized to accept a standard tall kitchen trash bag. The arch assembly is designed for the direct mounting of the Doyle Wall-Mount PowerVac, which provides outstanding vacuum performance in a compact package (available in custom colors by request). The vacuums can be set-up with either an on/off toggle switch, a push-button switch with a timer, or coin/bill/CC operation. The system offers the clean look of a vacuum arch, without the need to incur the costly installation of a large central vacuum unit and all the associated piping — all that is needed is a power line. What’s New/Best Seller • Elephant-Vac System.